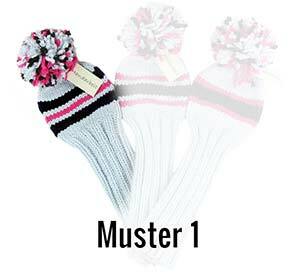 Our knitcap golf headcovers consist of a wool-polyacrylic mix. The advantage: It looks like wool and feels like it as well, it is springier though, easier to clean and therfore corresponds to your sporty challenges on the golf course. Due to the acrylic content the Golf club cover is durable and dries even faster if it gets wet. The thick wool protects your golf clubs from scratches and damages if your golf clubs knock against each other in the golf bag. The shaft usually extends to the seam of the golf bag. If this is not long enough, you may buy an extension of the shaft of 5cm (1.97 inches) for an additional charge. That way, the shaft will protectz your golf club even inside the bag. Go to the golf headcover configurator! Of course our golf headcovers are ideally suited for teams with own logos. Those can easily be sewed on the covers. Businesses can bring to mind memories of golf tours, golf tournaments or other golf events positively and sustainably by having their brand names put on the head covers. Of course, a golf headcover will always be a great gift for any golfer. Our golf gifts will surely surprise any of your golf friends and partners! Take a look at Youtube and watch our golf headcover videos. The first video shows our head covers in a golf bag. They stay on the golf clubs even during transportation and will no slip off. See yourself!